The Best Rate Guarantee took me five days to straighten out, but my $267/night stay at Park Hyatt Tokyo is finally booked! The savvy hotel traveler will often want to check on rates for an upcoming stay many times, in the hopes that rates will decrease in price, or that additional availability might open up. 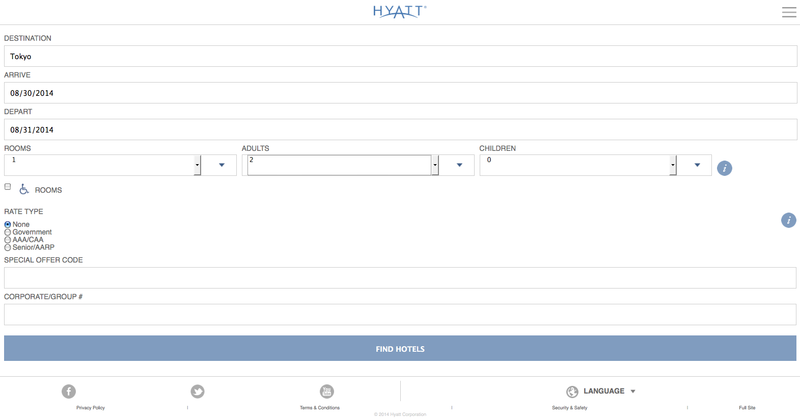 However, the Hyatt website does not make it easy to do so. We see that there is no Twin Room availability of any sort, so we make it a point to bookmark this page and check the rates again later. Sorry, back to the beginning you go. Like many hotel websites, Hyatt uses something called a “session”, which is short, predetermined period of time that you can access the website. Once the session expires, you will have to return to the top page to start a new session. This is done to safeguard against hackers being able to intercept your data and steal things such as credit card deals. Which is an important thing to do, but it comes at the cost of our convenience. Every time we want to look up availability, we have to start from the beginning and enter in all of our information all over again. 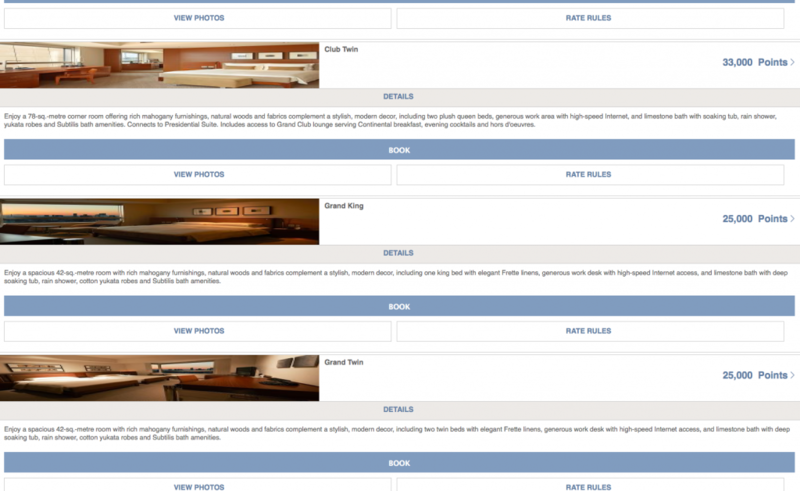 The Hyatt will grab this information encoded in the above URL and use it to create the availability results page as it creates a new session. So as long as we save our search information in the above format, we can easily look up any rates at any hotel we want with a single click! Of course, I don’t expect a normal person to create a URL like that on their own. 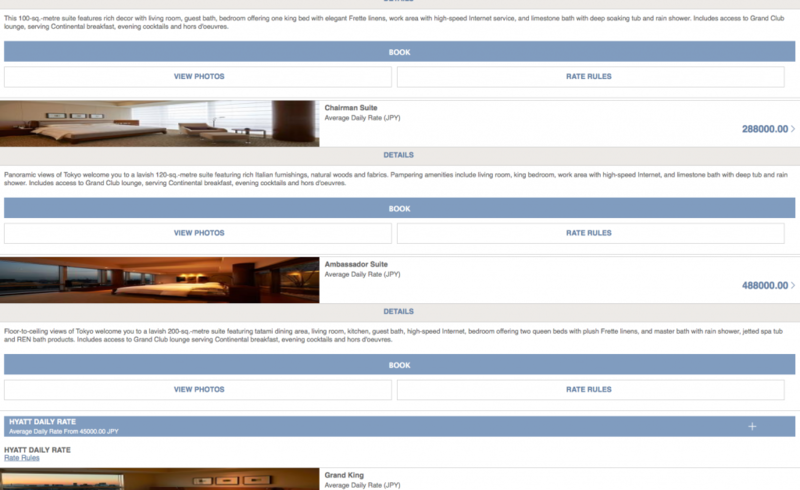 To simplify the process, I have created the Tokyo Hyatt Power Search, that will allow you to create the above link for any valid date for any Tokyo Hyatt hotel that you wish. 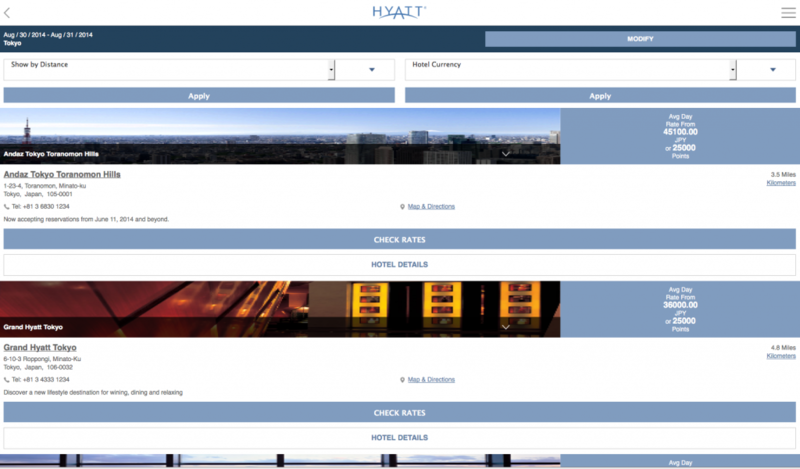 And if you don’t want to be limited to just Tokyo Hyatts, the All Hyatt Power Search will create bookmarkable links for all 587 current and future (as currently known) Hyatt hotels throughout the world. 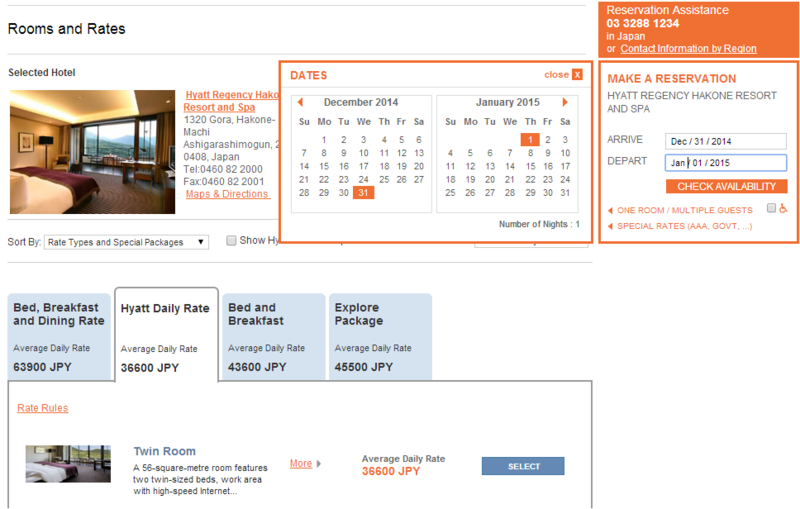 And for true power users, there’s the Tokyo Hyatt Date Range Search and the All Hyatt Date Range Search. A straight four night reservation may not always bring up the cheapest rate; sometimes it can be cheaper to book two consecutive two night stays, or a three night stay with a one night stay. The Date Range search will bring up links for all possible combinations of reservations for stays of up to nine nights at a time, allowing the most ardent deal searchers to ensure that they are getting the best total rate that they possibly can. 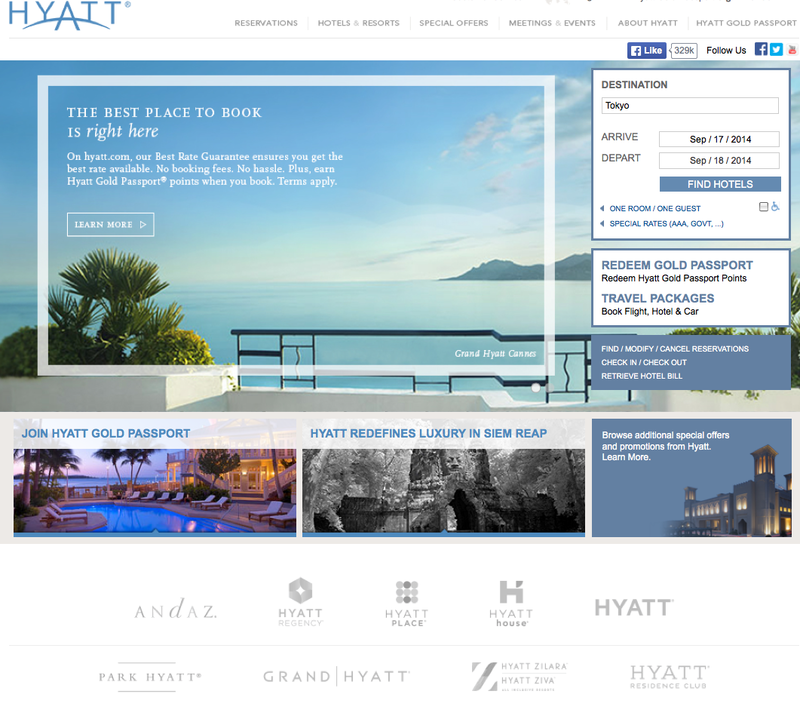 Did you know that Hyatt has a special mobile website? They would probably prefer that you didn’t, as they try to steer you towards their mobile application. But it does exist, and it is gloriously wonky, especially when viewed on a desktop. It’s built for vertical phone resolution, so everything gets stretch out when viewed on a computer. It returns us a list of all hotels in Tokyo for that period, and the lowest price available. Pictures getting stretched waaaay out there. 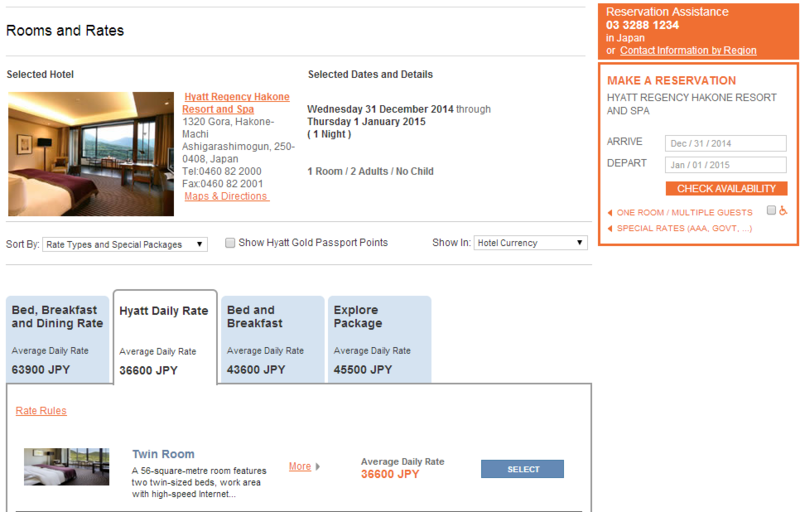 The Grand Hyatt Tokyo rate looks decent, so let’s click the CHECK RATES bar for that hotel. All of the information related to our request is right there in the URL. I will leave it as an exercise to the reader to figure out what all of these entries mean, but for now let’s focus on the areas checkout and checkin. 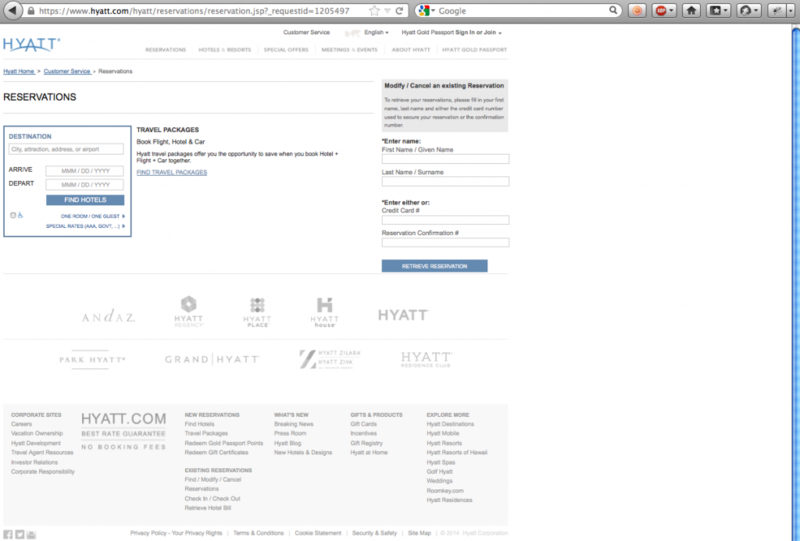 In our previous Stupid Hyatt Website Trick, we used an elaborate trick to create a “Frankenpage” that allowed us to view the price on rooms for any date, even when the room was all sold out. But with the mobile page, could it be that the process is as simple as merely changing these dates in the URL to whatever we want to see? Hit the Enter button, and look what we get! That…that was much easier than what I was doing before! Not only can we use this to see whatever day’s rate we want, but we can also bookmark this link and refer to it any time we like! 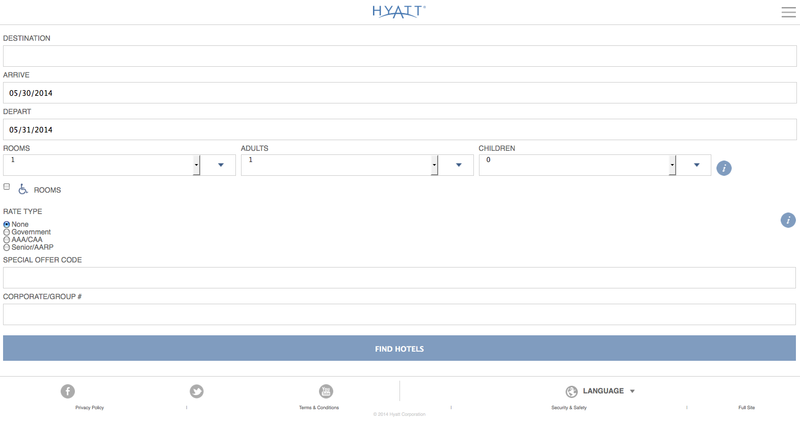 The Hyatt mobile experience can provide great convenience over the regular website…but it can also be the source of much tantalizing frustration. An example of this can be found when attempting to modify a booking. 25000 points for a regular room, 33000 for a club room. We’ll attempt to make a points booking for a Grand Twin. Clicking the BOOK button, you are prompted to log in, on account of needing access to your account to see if you have enough points available. Valid login information to be supplied by you, the reader. An interesting thing to note is that the group/corporate code for a points reservation night is “54749″. This information does not show up anywhere on the main website…and also provides proof that a group/corporate code isn’t in and of itself a factor that limits who or what organization can use it. Anyway, suppose we’ve had a change of heart, and want to get ourselves an even better room. 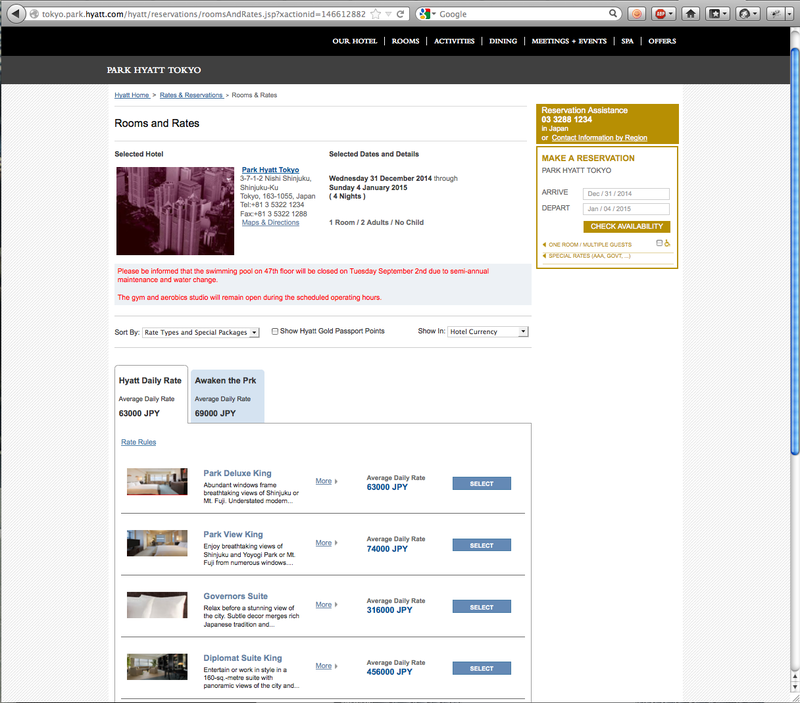 Click the “Modify” link on the bottom right to go back to the list of rooms for booking. Because the first thing we look for after checking a points reservation are high end suites. …c’mon, did you think that this would buried in a Stupid Website Trick if it actually worked? DAMMIT! What does that even mean!? Alas, the Mobile site bends like the willow…it does not break like the oak. But, understanding that, you might have fun exploring on your own to find out what other secrets it might hold. 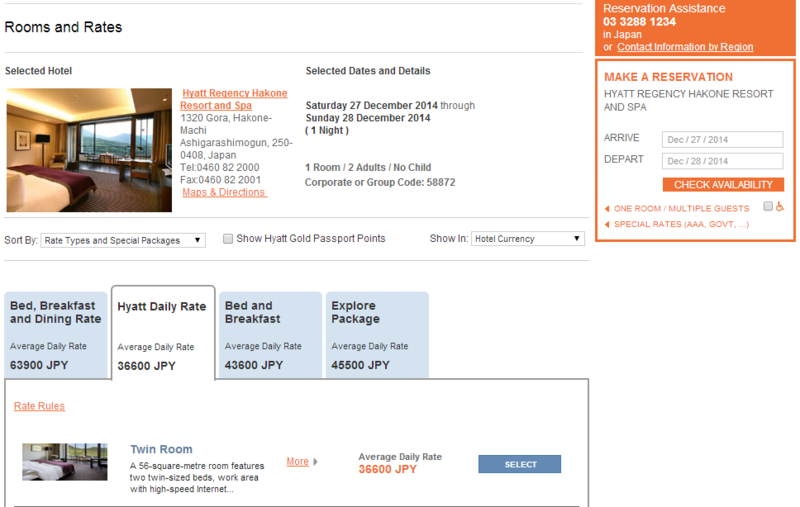 The previous article on New Years Eve rates left out the Hyatt Regency Hakone Resort and Spa, as there is no availability for that date whatsoever. But, if it does open up again, what will the rates be? Of course, there’s a Stupid Hyatt Website Trick for that. The trick is that we must first look for a date that we know plenty of availability. Let’s go back about 2 weeks before that. Changing the dates to December 31st – January 1st. Alright people, move away, nothing to see here. According to the website, New Years Eve rates are now available, and for the same price that we saw for December 16th! But it’s only when we click the SELECT button for the Twin Room at the Hyatt Daily Rate (just as an example…any rate and room we select will do) that things get really trippy! IT’S TWO PRICES AT THE SAME TIME! 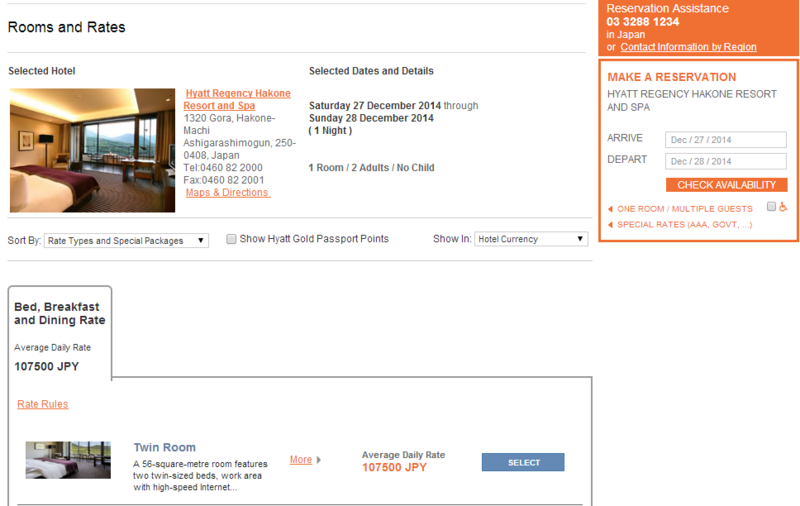 On the bottom of the page, we see the room rate charges as it would be for a December 16th reservation. 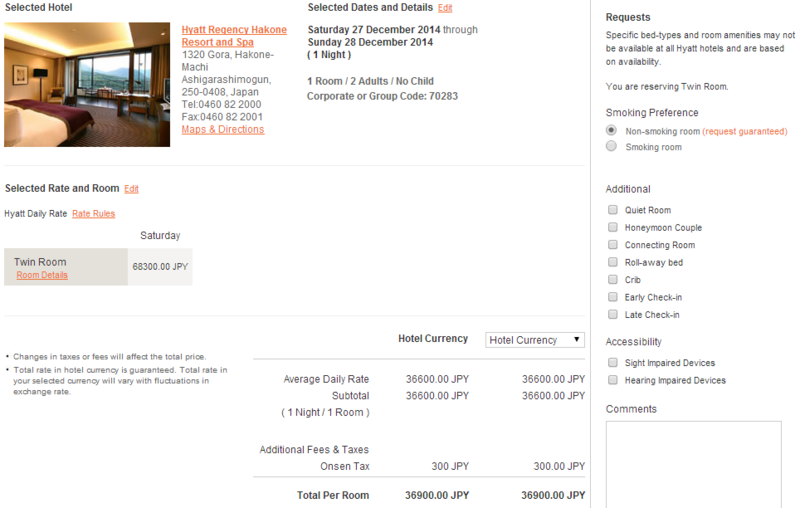 But in the left side of the middle of the page, under the Selected Rate and Room area, we see a completely different rate of 68300 yen! It turns out that hitting the back button from the Sold Out screen creates a “Frankenpage”, where the date information is from the previous request, but the rate information is from the request before that. 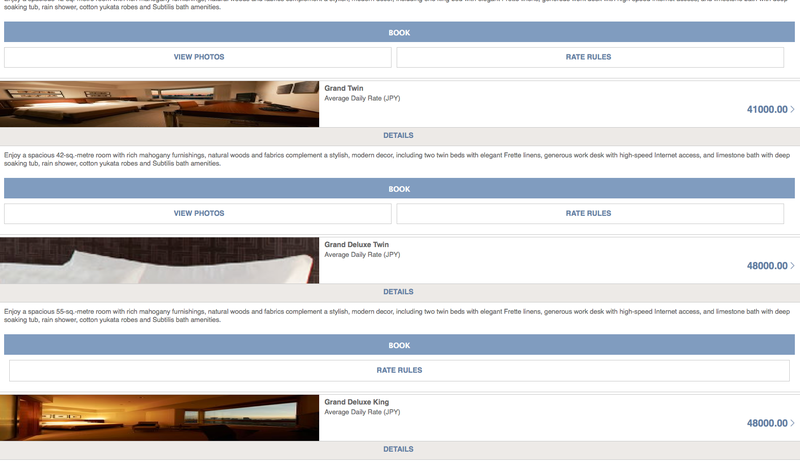 And when you try to make a booking, the bottom part of the page uses the previously cached booking information from December 16th, the Selected Rate and Room area grabs the information from the most recently entered December 31st date. 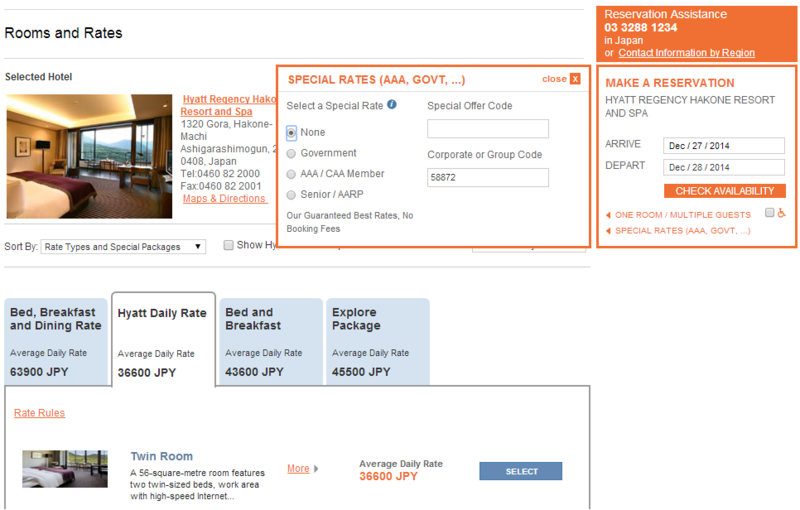 In other words, the Selected Rate and Room section tells us the real rate price of the room for the sold out inventory! The booking engine looks at the real availability for December 31st, and even though this technique lets you “try” to make the booking, ultimately, the attempt will fail. So this trick merely lets you look at some information that you wouldn’t otherwise be able to see. Doing it that way only works if there is absolutely no availability at the hotel; if there is any availability at all, a rate will display and the browser back button bug doesn’t occur. But we can combine this with the technique we learned in our previous Stupid Hyatt Website Trick to open up information on limited availability as well. Our prices prove that we’re twice as good as the Park Hyatt! And when we click SELECT, we see that this room really should be going for 68300 yen. With so many screenshots, I’ve run out of pithy things to say. I’d love to hear if someone could come up with a practical application for this trick!